A group of major ad industry associations is launching a new organization, Privacy for America, that aims to shape federal privacy laws. 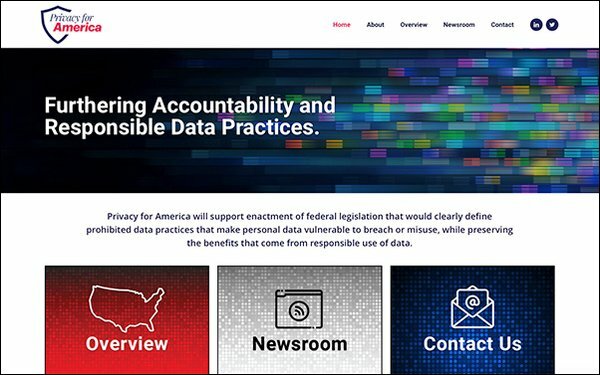 The new organization says on its website it plans to advocate for a federal privacy law that would establish "comprehensive, clear and enforceable privacy rules for the entire nation." The coalition includes the Interactive Advertising Bureau, Association of National Advertisers, American Association of Advertising Agencies and Network Advertising Initiative. The group also plans to ask Congress to outright ban some practices -- including using data to discriminate against people based on factors like race or religion, and using data to reject applicants for insurance, jobs, housing or credit. That component of the platform was unveiled last month at a conference of the Association of National Advertisers. "This framework would create new national protections for consumers backed by enforcement and strict penalties for those who do not comply," the group writes. "The legislation would shift the burden from consumers by allowing them to depend on these strong national standards without having to rely on reading hundreds of lengthy privacy policies in order to protect themselves." The new organization says it also supports beefing up the Federal Trade Commission by creating a new “data protection” bureau at the agency, and granting the FTC the ability craft privacy regulations in some circumstances. Jessica Rich, former director of the FTC's Bureau of Consumer Protection, is among the new group's advisors. The new initiative drew some skepticism from privacy advocate Jeff Chester, executive director of the Center for Digital Democracy. He said the organization should offer more details of its proposal, including what data practices it would support banning outright. “It’s at most a PR effort that will not derail the historic push for strong privacy legislation being supported by consumer, civil rights and other groups,” he said in an email. The industry's move comes as Congress is gearing up to consider new privacy legislation. Last year, Sen. Ron Wyden (D-Oregon) unveiled a draft of a bill creating a national “do not track” regime that would give consumers the right to prevent information about them from being shared or sold by ad-tech companies.